So, left Wien, stopped for petrol at the border before getting in to Hungary. Big Mistake!!! In Austria, Hungary, Slovenia, and Switzerland you are required to buy a Vignette which covers you for road tolls. Italy still uses toll booths and France, Belgium, Germany, Poland, Czech, most of the UK don't have any tolls. At least this is the way I believe it to be. Anyhow, at the petrol station these Austrian cops were just hanging around the Hungarian Vignette stop handing out tickets for no Austrian vignette. I thought they were just helping people find the vignette seller for Hungarian. Yes, I'm dumb. The photo shows yours truly holding 65 euros ( $105 cdn) which I donated to the Austrian government as I had not bought a vignette for Austria. Shortly after that I donated another 5 euros to the Hungarian government to cover my tolls ahead. Made it to the lovely Budapest traffic around 7 pm and eventually Andras' house, another Couch Surfing host. Parked the bike, got changed and jumped in his car to venture into town for dinner. View from my room. You can see the busy city in the distance. Of course the rain had to show up as we started down the big hill into town. And then hail! Hard rain prompted Andras to offer a ride to a couple of people, who he didn't know, at bus stops along the way down the hill. The road became a river. See video. One of the bus riders, Nora, decided to join us for a little tour of the city and dinner, which I thought was very cool and adventurous of her. She enjoyed speaking English with me. I was quite surprised that a lot of people in Budapest could speak English. Up in the Buda hills. View of the Chain bridge from the Buda Hills. Budapest is actually Buda and Pest which is separated by the river. Buda is more suburbs and Pest is more inner cityNote: Buda is on the West side of the river and Pest is the East side. The next day Andras invited me to stay another night at his place even though he was hosting another person that night and recommended I ride up to the castle above Visegrad for the morning. Thanks for making room at your place for one more night. The road out to Visegrad was full of traffic as per the norm. 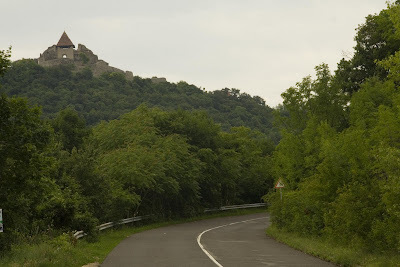 Traffic thinned as I got to Visegrad and made my way up to the castle. C7/8,R3,T2,V6/7 (only about 5 km of road around the castle had this rating). Hungarian Ski Field. Steep and short could make for some tight stops at the end of your run. On the way back to Andras', I got caught in a rain storm so I pulled over and had a beer while it passed. This guy on the scooter decided to ride through it and got soaked. 1 Euro ($1.62 Cdn) gets you 270 Hungarian Forint. 600 to 800 HUF for a beer at the bar. What is this??? See the video to find out. Out for a couple of drinks with Andras, Tomas, Big Andras, Nora and Magda. Note that the alcohol tolerance for driving is zero in Hungary. Just a note. Two Foosball punks that Nora and I beat up on at Szimplakert, haha! The next morning, grabbing up my stuff and preparing to start heading West. 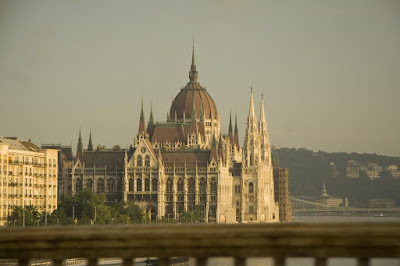 Budapest would be my furthest Eastern destination and I was very happy I pushed myself to go there. It was not on my original plan. Andras, Nora, and Magda seeing me off.